i am writing to you with an apology. it would appear Our Shed and myself have been completely and utterly pants at getting prepared for your big day on friday. i fear we have let you down with our two year old, covered in green mold, union jack bunting i retrieved two days ago from around the veggie patch. to be fair i did give it a spin in Miss W. Machine but alas my high hopes were dashed when i retrieved a large knotty mess from her inners and still bearing the signs of green in places, from several winters hanging around outside. after a few moments of 'knotted bunting' rage i admitted defeat and gave the responsibility of unraveling the mess to my man. 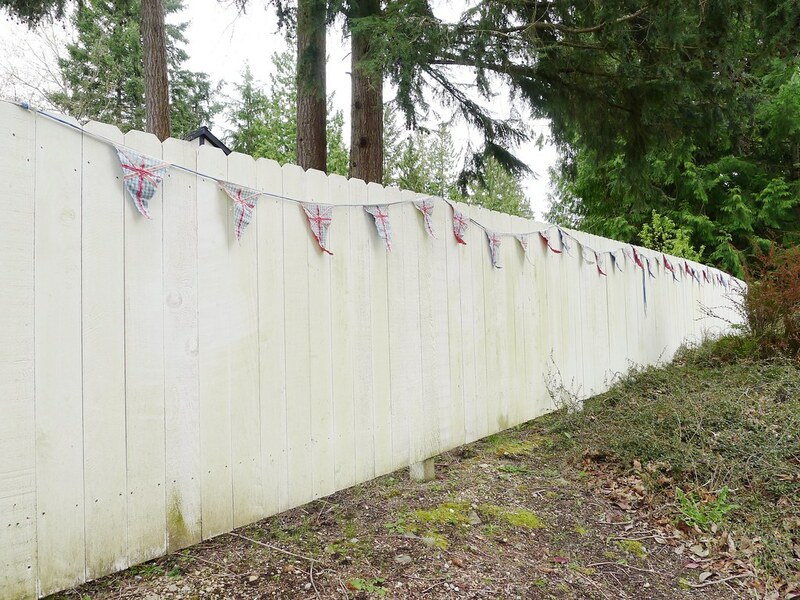 in a trice he had it all sorted and with the aid of Our #4 i headed out to the front of Our Shed to hang our faded bedraggled bunting along the 'also greeny' white fence, so passersby would know where our loyalties lie. in my defence for only having this little offering to show for friday's big day, i must say 'wedding souvenirs' are in short supply in this neck of the woods and despite thinking it would be marvelous to handcraft a ton of union jack goodness to deck out Our Shed, i have been complete crappity crap in mustering up the energy. however i have comforted myself with the knowledge Mossy Shed is not 'en route' for the wedding procession and therefore you will not have to see first hand my pants attempt at being patriotic. to make up for our lack of regalia i will be staying up late tonight to watch an hour long 'behind the scenes' special on all your wedding prep. this is a huge sign of my dedication as i know out of the hour, only 28 minutes will actually be about you and your special day, the other 32 minutes being commercials but i am quite sure it will be worth it. talking of commercials i did catch one the other day offering me a replica of your lovely ring, Kate. not having seen your ring in person, i was not sure how accurate it was. however the folks trying to get me to buy one were very excited about it so i can only assume it was spot on. indeed they were so confident i would want to pick up my phone right then and there to own it for only $29, i was told to hurry as stocks were limited and due to popular demand only one ring per household. and lastly, before i leave you to get on with all those last minute pesky things which need to be done for the show to go on this friday. i have been toying with the idea of setting my alarm for 3am so i may watch your lovely wedding live, but alas the old person in me just cannot do such a thing. therefore i wished you to know, despite my lack of royal 'swags and tails' around Our Shed, and indeed the fact i will be watching you say your vows on a recording several hours after you spoke them, (whilst sitting in pyjamas eating leftover easter eggs) and also not sending for an exact replica of your pretty ring to show my admiration. i am in fact very happy to know you are tying the knot and wish you the happiest of happy lives together. how refreshing. its nice to hear from a brit who is not foaming at the mouth about this! gosh really! and the commercial made it sound such a bobby bargain! see this is why i do not watch telly usually 'cause i fall for such things. as i keep my head in the sand on such matters i do not know how many folks are delighted or not about the royal day back in old blighty. i think your patriotic offering is perfect....understated yet chic....like the new princess herself....i am sure she would approve...and the ring...dear oh dear what to do! i (foolishly) rose early all those years ago for the original royal wedding (charles and di of course) as there was no vcr to be had, then staggered into work late, but it was worth it....however, my trusty vcr still works and i will be taping this time....can't wait! Gee, Tif, you had me howling! As a true-blue Anglophile and all-things-England lover I can't wait to see the Royal Wedding . . . also the next day, and probably also in my jammies! I, too, have seen the highly appealing commercial for the $29 EXACT replica of the ring - but have managed to hold off purchasing one as well. Thank you for all your delightful tales of old blighty! Keep them coming! Oh goodness, this post just made me smile, and Arthur's comment just made me giggle. "A postmodern, ironic way," is just too funny. Hi Tif, I'm excited about the wedding too, but am with you on waiting to see all the replays the next day. 3 am? No thanks!! We just got back from a birthday trip to the beach in our trailer.. I put lots of pix on my blog, I hope you come and see! This post made me giggle. I enjoyed it very much:) I most enjoyed that you used "pants" not once, but twice. Bravo. Heather :) i know, risque or what! I love your letter and adore your uj bunting. Our village is covered in bunting... partly for our beer festival this weekend and partly for the wedding. It looks lovely either way. 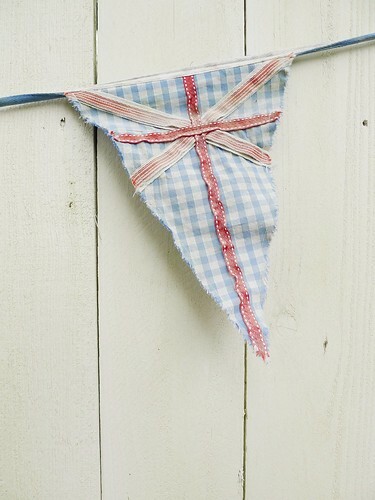 I am not allowed to hang bunting. My holiday boxes are way overstocked and husband has put the kibosh on more holiday boxes - quite rightly. I did however find some cute red, white, blue balloons that are definitely going up. OOooo...You're in 'Simply Homemade' magazine too! I've just found you on their 'Inspiring Blogs' page. (p.87:o) ). Congratulations on your magazine 'appearances' Tif. Thanks to Mcvities, I now have a special commemorative tin featuring the happy couple, which has been filled with embroidery threads, also in "a post-modern, ironic way" (thanks, couldn't have put it better myself!). Tif - your plan to watch the wedding in pjs with easter eggs sounds like perfection! I watched the ceremony twice, once live and again this evening. I savored every minute of it. I am so impressed by how elegant and distinguished Catherine is. She truly shown in her elegant simplicity. She is so beautiful and poised, she could have worn anything and still looked resplendent. At first peek, I was a trifled disappointed that her dress wasn't a bit more elaborate, but in retrospect, I think it was perfect, for both her and the occasion. So refined and dignified. The way she carried herself really made the dress veil and tiara look gorgeous. That's her secret. The more I saw of the other outfits and hats at the wedding, and the souvenir shop (albeit, patriotic) outfits outside on the common folk, the more I appreciated the class that Catherine has. I don't understand why so many women invited to the wedding felt the need to outshine Catherine on her special day (except her mother and sister), and wonder if they know how badly they failed. I'm all for hats for a special occasion, but most of those hats were worthy of a Mardi Gras parade, or the Mummer's Day Parade, if you know what that is. I can't get over what a splendid ceremony it was, beautifully executed; truly regal. Long sigh. Did you enjoy it? annon :) it is interesting isn't it about her dress, i for one actually loved her dress and really liked the veil and tiara, having been through my own wedding day and that being at the tail end of the 80's i would opt for less is more anytime now!